Nvidia has revealed a new trick for its latest Turing-powered graphics cards, namely mesh shading, producing a demo for developers, plus a short video clip, to show off the technology. The basic idea is that mesh shading helps to considerably boost performance when rendering a large number of highly complex objects in games. As Nvidia explains in a blog post: “Turing introduces a new programmable geometric shading pipeline built on task and mesh shaders. These new shader types bring the advantages of the compute programming model to the graphics pipeline. “Instead of processing a vertex or patch in each thread in the middle of fixed function pipeline, the new pipeline uses cooperative thread groups to generate compact meshes (meshlets) on the chip using application-defined rules. What does that mean in practical terms? Essentially that the GPU’s mesh shading tech can take a lot of load off the CPU, and by using the aforementioned efficient culling techniques and intelligently adjusting level of detail, far fewer triangles have to be drawn when rendering the asteroids in the demo – while still maintaining a high level of image quality. And because there is less work to do in terms of rendering those triangles, performance will be boosted and frame rates will run faster. And you shouldn’t notice any difference in the image being presented, compared to what you’d see if all the triangles were being drawn. Nifty, eh? If you have one of the new GeForce RTX cards, and you’re a member of the Nvidia Developer Program, you can download the Asteroids demo here, and check it all out for yourself. Otherwise, you’ll have to be satisfied with the video below for the time being. As you’re probably aware, Turing GPUs have previously employed similar tricks such as adaptive shading (and variations therein), which again takes implementing shading to a more efficient level. Indeed, adaptive shading arrived in Wolfenstein II: The New Colossus via a patch in November, with some performance benefits observed online (to the tune of around 5% from what we’ve read, at least in some cases). 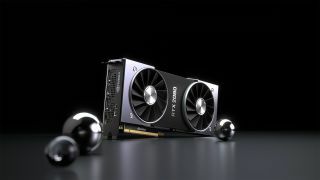 And you’re very unlikely to have missed the fact that the RTX cards use ray tracing technology, which Nvidia has made the biggest fuss about, naturally. It’s still early days for all this though, in terms of support from developers and games.